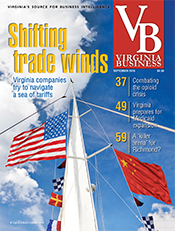 Chief executives at Virginia’s largest publicly traded companies averaged a 3.2 percent increase in total compensation in 2014, thanks to a sustained bull market that yielded higher shareholder returns. 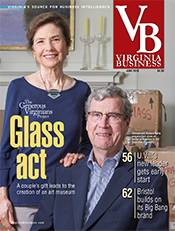 Reflecting pay-for-performance practices, board directors in Virginia are tying more of an executive’s compensation to achieving specific milestones, while also curtailing use of long-term cash payouts. Those are among the highlights of an annual study by Equilar Inc., an executive-compensation consulting firm based in Redwood City, Calif. Virginia Business commissioned Equilar to analyze CEO compensation at 40 public companies in the commonwealth posting at least $1 billion in annual revenue. The research, based on each company’s most recent proxy statement, examined changes in total compensation from 2013 to 2014 for CEOs who had headed their companies for at least two consecutive fiscal years. For CEOs who were not in place in 2013, their compensation for 2014 is not factored into the current year’s group average. 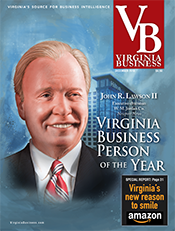 Virginia’s top execs in 2014 received average total compensation of $7.2 million, up 3.2 percent from the previous year’s average. Total compensation combines salary, cash bonuses, stock awards, stock option awards, long-term cash awards and other incentives. The state’s public CEOs received performance-based equity awards valued at an average of $4.4 million, or nearly 62 percent of total median compensation, underscoring the heightened scrutiny on executive pay strategies. 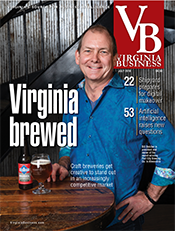 And Virginia’s chiefs fared better than some counterparts at the largest U.S. firms, at least on a percentage basis. An executive compensation study conducted in June by Equilar and The Associated Press found that CEOs at S&P 500 companies earned a higher median salary in 2014, $10.6 million, but that figure is up less than 1 percent from the previous year. Another study by Equilar and The New York Times focused on the 200 highest-paid CEOs at public companies with at least $1 billion in market capitalization. It found the median pay was $17.6 million, or an increase of 1.9 percent compared with the previous year. The highest-paid executive in that study was Discovery Communications’ CEO David Zaslav who came in at $156.1 million. 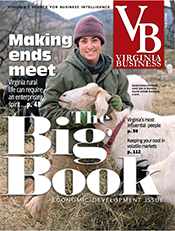 In its Virginia analysis, Equilar found that 16 companies awarded stock options to their CEOs, and only three executives received long-term milestone cash payouts, continuing a trend seen over the past several years. Companies instead are shifting to performance-based equity vehicles as a growing component of pay. “Option awards are going down, not only the number of options granted but the overall value of options granted. 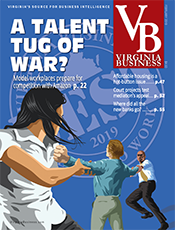 Subsequently, we are seeing pay-for-performance awards become a much bigger part of equity compensation for CEOs, nationally and in Virginia,” says Dan Marcec, director of marketing and communications at Equilar. 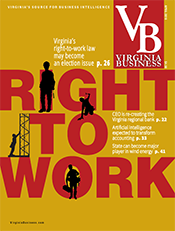 Equilar said the base salary of Virginia CEOs climbed 4.7 percent in 2014 to an average of $957,835. The median cash bonus jumped nearly 6 percent to $1.46 million. Thirty-four of the 40 companies gave their leaders a bonus in 2014, with the largest bonus, $4.4 million, going to Capital One Financial Corp.’s Richard D. Fairbank. 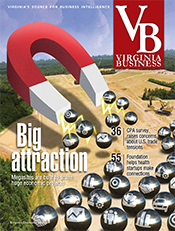 Total shareholder return at Virginia companies averaged 9 percent. Although the economy is stronger than it was in past years, most employees still are waiting to reap the dividends. Worker pay is expected to rise 3.1 percent in 2016, after hovering between 2 and 4 percent since 2009, according to a study in August by WorldatWork, a Washington, D.C., trade group. Still unclear is how compensation committees will handle controversial new reporting guidelines that require them to disclose pay disparity between CEOs and employees. A final form of the new rule was released in August by the Securities and Exchange Commission. The effort to let shareholders know the difference between the CEO’s pay and that of the employee rank and file is part of the implementation of the Dodd-Frank Wall Street Reform and Consumer Protection Act passed by Congress in 2010. The new rule says public corporations will have to disclose the ratio between CEOs and a company’s median-paid employees. That refers to someone with a middle point in pay, with the number of people making more the same as the number of people making less. The rule asks companies to make this calculation every three years. In 2013, the most recent year for which data is available, the median income for U.S. households was $52,250, according to the U.S. Census Bureau. In Virginia, that figure was $62,666. While Dodd-Frank is intended to make CEO pay calculations more transparent, it does not appear to have slowed the rate of growth of executive compensation packages. Marcec says the booming stock market of 2014 has mitigated some of the regulation’s impact. “The notion is that [having] more regulation will put downward pressure on CEO pay. To date, that hasn’t been the case. We’ve seen CEO pay rise every year since Dodd-Frank was passed. It is having an effect on the overall pay mix, but ultimately, if the company performs well, we’ll continue to see compensation rise. 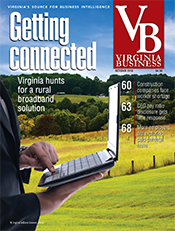 And we’re certainly seeing that trend in Virginia,” Marcec says. Among the 40 companies analyzed, four are newcomers to the list: Internet company Verisign Inc., Engility Holdings, consulting firm Towers Watson and Federal Home Loan Mortgage Corp., better known as Freddie Mac. 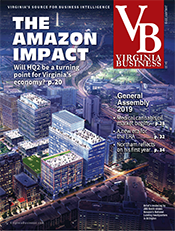 In its research for Virginia Business, Equilar said 21 companies provided CEOs with a salary bump, while base salary for 10 CEOs remained unchanged from the previous year. Two CEOs, David F. Melcher of Exelis and ManTech International’s George Pedersen, saw their base salary decline. Six execs had not served two consecutive fiscal years, and hence no year-to-year comparative data was available. Another CEO, Richard D. Fairbank at Capital One Financial Corp., forgoes an annual salary in favor of stock. 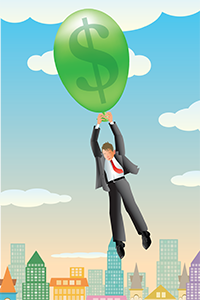 With a pay deal valued at $19.6 million, Fairbank, 64, claims the top spot in the 2014 survey. The longtime chairman and CEO of Capital One saw his overall pay rise 7 percent. While Fairbank received a cash bonus of $4.4 million, the balance of his compensation came in the form of equity awards valued at more than $15 million. Finishing a close second to Fairbank is Paul Saville, president and CEO of Reston-based homebuilder NVR Inc. with $19.2 million. Saville’s combined pay shot up 180 percent year over year. Equity awards of $16.9 million account for most of the value. Saville, 59, got a 30 percent salary bump to $1.42 million, while his bonus of $885,209 fell 18 percent from more than $1 million in 2013. NVR’s revenue and net income each increased 6 percent in 2014, although the company noted the homebuilding market remains uneven as prices level off. NVR also provides a window into say-on-pay practices, another emerging component of Dodd-Frank. The company said in its proxy that 97 percent of shareholder votes cast in 2014 approved its executive pay packages in the nonbinding advisory vote. Phebe Novakovic, the chairman and CEO of defense contractor General Dynamics Corp., fell to third on the list at $18.99 million. Last year she became the first woman to claim the top spot in the survey. 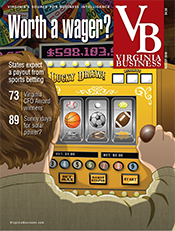 Novakovic, 57, is the only Virginia exec to top $5 million in combined salary and bonus. Her $5.8 million total includes a 4 percent salary hike ($1.56 million) and a $4.25 million bonus, up 6 percent. General Dynamics derives more than 60 percent of its revenue from U.S. government contracts. Yet in spite of Congress’ sequester-driven budget cuts, the Falls Church-based maker of heavy combat equipment posted 2014 revenue of $30.8 billion, down only a fraction of 1 percent year over year. Under Novakovic’s leadership, General Dynamics said it expanded margins and provided “particularly strong total shareholder return” of 47 percent in 2014. The pay for Dominion Resources Inc. CEO Thomas Farrell spiked to $17.3 million in 2014, up 59 percent from $10.9 million. Farrell’s $3.5 million annual bonus is 108 percent higher than the $1.69 million he earned the year before. The 61-year-old Farrell also received a long-term cash award of $6.5 million, along with $5.7 million in stock awards. Rounding out the top five is Computer Sciences Corp. (CSC) executive, Michael Lawrie, 62, who was awarded a pay package valued at $15.4 million. Since taking the helm, Lawrie has built CSC’s market capitalization to more than $9 billion by systematically winnowing noncore and underperforming business units. His 2014 pay includes $11.9 million in CSC equity awards. Lawrie’s annual bonus of $1.87 million fell 14 percent while his $1.25 million salary remained the same. Other CEOs pulling in eight-figure pay deals include Wesley Bush at Northrop Grumman Corp. ($14.9 million), CarMax boss Thomas Folliard ($11.3 million) and Charles “Wick” Moorman, former CEO and continuing chairman at railroad giant Norfolk Southern Corp. ($10.4 million). Norfolk Southern’s new CEO, James Squires, took the helm in June. Conversely, Lumber Liquidators LLC boss Robert M. Lynch saw his compensation tumble 87 percent amid reports the company is being investigated by the U.S. Department of Justice for importing Chinese-made laminate products with high levels of formaldehyde. Lynch’s compensation fell sharply, from $6.6 million in 2013 to $858,598 in 2014. Lumber Liquidators’ shareholders also took it on the chin, with total returns sliding 36 percent. Lynch resigned last May. Equilar’s Marcec said compensation committees increasingly are using shareholder return as a metric to balance CEO pay and long-range strategic vision. Generally, he said, Virginia CEOs got raises when their companies showed positive shareholder returns year over year.